Most Salesforce implementations start (or end) with a dedicated Salesforce administrator configuring all your data to the right format that Salesforce can ingest, then uploading csv lists of existing contacts gathered before Salesforce was introduced. Afterwards, updates to leads, contacts, opportunities, and conversion events are done within Salesforce itself, or by other tools you have installed which send data to Salesforce via built-in integrations. Without integrated tools to update Salesforce when changes to your leads/contacts happen, you need to configure a system to upload updated CSVs daily, or build an ETL pipeline. 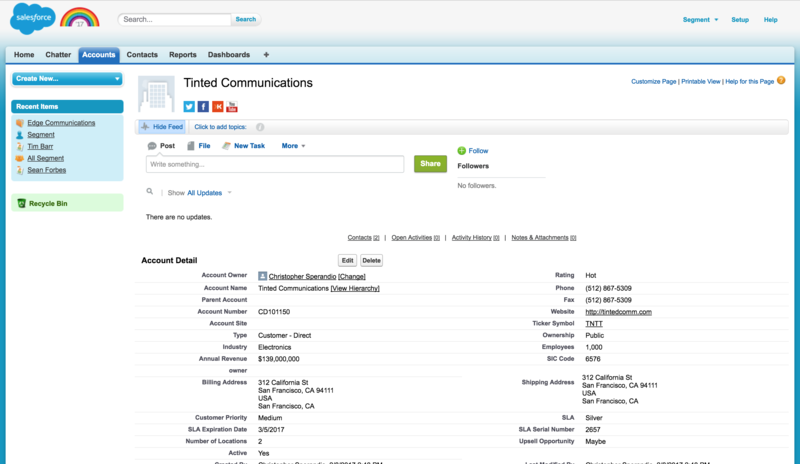 Salesforce functions like a database for your customer and prospect relationships. 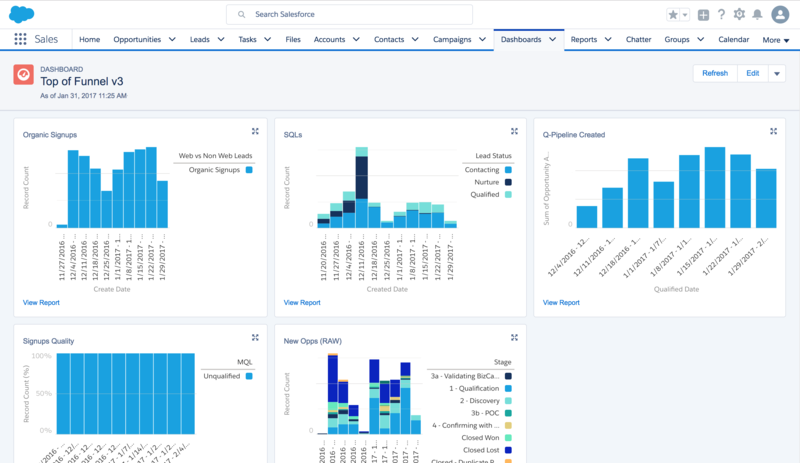 Process sophisticated visualizations of all your data within Salesforce for custom dashboards. A redesigned UI (though both old and new are simultaneously available) called “Lightning Experience” focuses records around funnel stages. When you use Salesforce with Segment, you don’t need to build an ETL pipeline or any repeating batch upload processes to keep your Salesforce instance up-to-date. 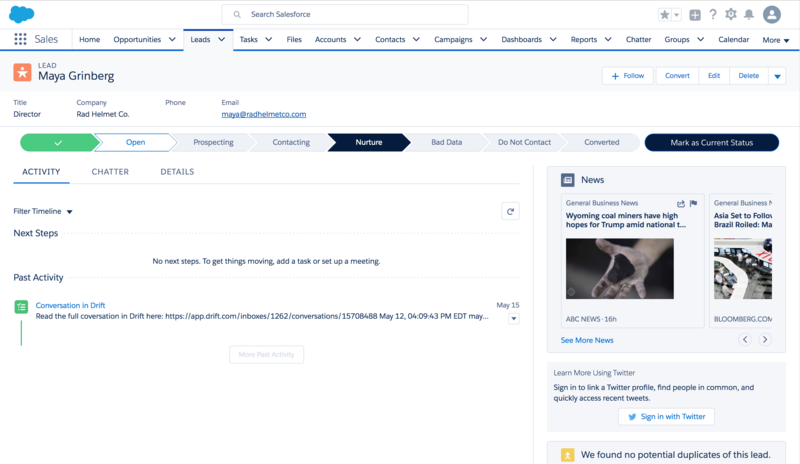 All of your customer data will stay updated in real-time, across every integration you have turned on in Segment, including Salesforce. Every tool that you use to interact with leads and customers will have the same updated information proliferated at the same time, so you won’t have to worry about different tracking systems or batch upload processes going off at different times, leading to periods where your records don’t match across systems. In addition to being a data integration, Salesforce is also a source of data within Segment. Developers are able to use Segment to pipe their company’s Salesforce data out of Salesforce and straight into a data warehouse, where they can query the raw data with SQL or other analytics languages of their choice. After this, they’re able to send the result of these queries back into Salesforce.